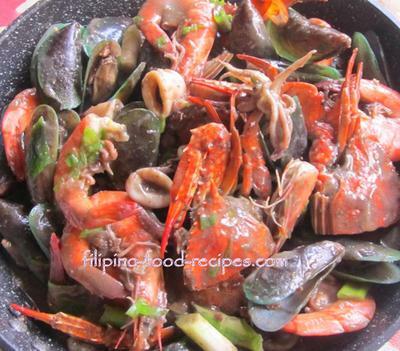 Seafoods galore is a mixed seafood feast, a combination of prawns, mussels, crabs and squid cooked in oyster sauce. It is a special occasion dish because seafood is not cheap, and which undeniably, everyone's favorite (well, except those with allergies or have high blood pressure). If you wish to cook this for a party but with a limited budget, try adding some vegetables, a la chopsuey style, so you will, at least, have enough for everyone. 1. Saute the garlic, onion, and ginger in butter. 2. Add the mussels, and cook for 1-2 minutes. 3. Mix in the prawns, crabs and squid. 4. Add the oyster sauce, water and the sliced leeks and bring to a boil. 5. Thicken the sauce with cornstarch slurry. 6. 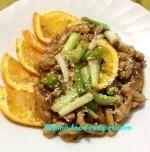 If you want it to be a little bit spicy, add some chili sauce or 1 piece sliced thai bird chili (siling labuyo).